Zone 9 is one of 13 United States hardiness zones. All hardiness zones are divided into two subsets, a and b. The purpose of the zone designations is to advise plant hardiness that's suitable for a zone's cold temperatures. The temperature of each zone is determined by the average minimum temperature during winter months. The hardiness zones are separated by 10°F. This means that Zone 9 is 10°F colder than Zone 10 and Zone 8 is 10°F colder than Zone 9. Zone 9: The minimum average temperature range is 20°F to 30°F. Zone 9a: The minimum average temperature range is 20°F to 25° F.
Zone 9b: The minimum average temperature range is 25°F to 30°F. The hardiness zones are based on minimum average temperatures. However, colder temperatures can occur due to unforeseen weather pattern changes. Changes made in the 2012 USDA (United States Department of Agriculture) hardiness zone map revealed a 5°F half-zone increase over the 1990 map. The National Gardening Association proposed the change was due to advancements in weather mapping technology. The 2012 technology was significantly more sophisticated than the technology used for the 1990 mapping. In addition to better technology, more weather tracking stations contributed data to the 2012 hardiness zone guide. Due to topography and climate conditions, states have more than one hardiness zone. Microclimates can create pockets of warmer zones in states that otherwise have significantly colder winters. For example, Utah has a wide hardiness zone range of Zone 4 to Zone 9a. Zone 9 is listed as a year-round planting zone. The generally accepted growing season length for Zone 9 is nine months since summer months are so hot. Summer heat presents a challenge to typical summer vegetable gardens. While some hybrids are bred specifically for sweltering heat, many heirlooms and non-hybrid vegetables don't thrive in extreme heat. Bell peppers balk at higher temperatures. Most pole green beans will stop blooming when the temperatures climb to 100°. Tomatoes love heat, but most heirloom varieties will stop blooming when temperatures rise to 90° and above. There are some heat-loving vegetables that thrive during Zone 9 sweltering hot summers. When shopping for seeds or plants, choose heat and drought tolerant varieties or hybrids bred to withstand high temperatures. Heat loving vegetables include sweet peppers (pimento and banana) and hot peppers. Other vegetables that thrive in summer heat include sweet potatoes, okra, eggplant, Chinese red or green long beans, melons and various legumes. Flamme, Mr Stripey and Pink Ping Pong, which may give higher yields, but smaller fruit. Clear Pink Early and Garden Peach give medium yields. Citrus trees thrive in Zone 9, but are vulnerable to unexpected cold snaps. Many tropical fruits can be grown in Zone 9, such as kiwi, passion fruit and guava; however, mango and papaya require temperatures warmer than Zone 9. Many apple, fig, pear, apricot and plum trees require a winter freeze to stimulate fruit production. However, some varieties have been bred specifically to thrive in Zone 9. There are more nut tree varieties for northern climates, but many species can survive in Zone 9, such as pecans, black walnuts and others. All zones have specific timeframes. Zone 9 is unique since the timeframe between first and last frosts can be less than one to two weeks in January. You can download a current frost date app that allows you to enter your zip code for a current frost timeframe. 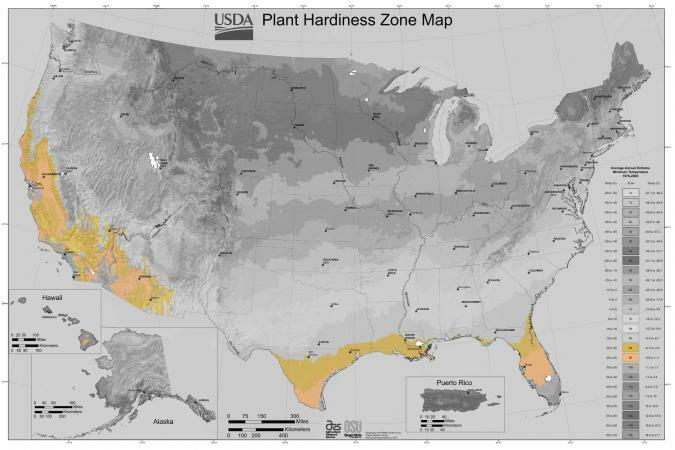 The USDA hardiness zone designations are based solely on temperatures. The guide doesn't include things, such as rainfall, microclimates, soil conditions/fertility, droughts and unusual weather patterns. All of these can impact the growing process. This information is available in Sunset's The New Western Garden Book. Zone 9 has an extensive growing season that is considered year-round. Using plant guides will ensure you only choose plants that will thrive in your region.